Be a social media star for Steve Hoffman! I read this article and found it very interesting, thought it might be something for you. The article is called Be a social media star for Steve Hoffman! and is located at https://votesocialism.com/be-a-social-media-star-for-steve-hoffman/. It was another week on the road for Steve making new friends – plus Pride activities, videos and yard sign selfies! • The Tacoma Weekly ran an article on the campaign’s speak-out against the LNG terminal last week. It’s available online here. If you haven’t yet signed the petition “Jay Inslee: Stand with the Puyallup Tribe – No LNG Fracked Gas in the Salish Sea!” it’s easy to do. Just click here. The site Redefine Tacoma has more information about the project and its dangers. • After speaking at the WFSE Local 1326 meeting in Yakima, Steve and Muffy went to their daily paper, the Yakima Herald, in hopes of an interview. Not yet. They did meet wonderful folks at the Yakima Nation Cultural Center in Toppenish, at the district WFSE Council 28 office, and at grocery stores, farm stands, libraries and parks around the area. 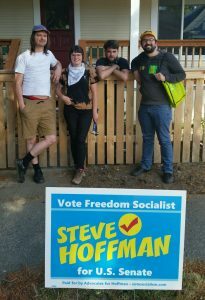 And they found a great place for a Hoffman yard sign! 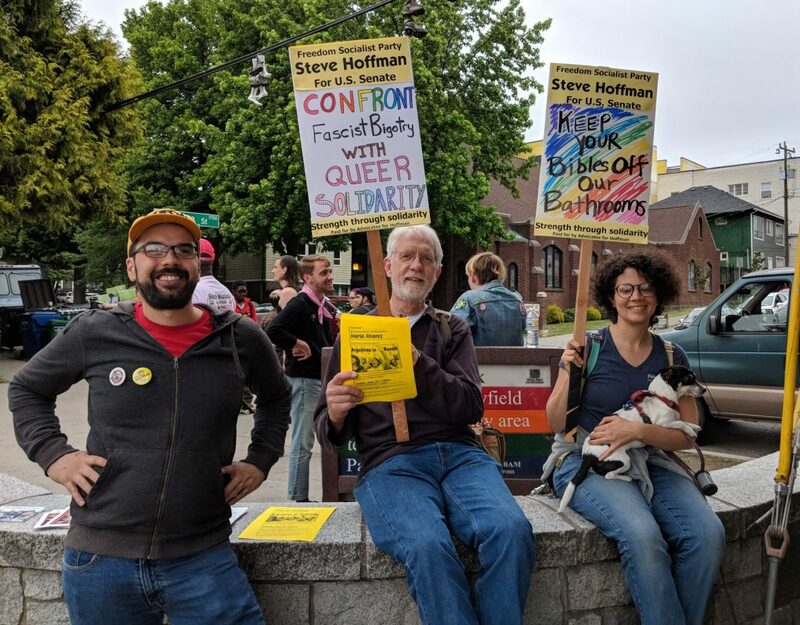 • Pride weekend is in full swing and Advocates for Hoffman are enjoying both the celebration and the organizing for full LGBTQIA rights! Steve also took a moment to share his thoughts on fighting the attacks against queer rights. You can view on YouTube here. 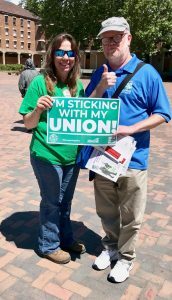 • In Bellingham Sunday, supporter Kathleen and Steve participated in the “Pan Union Rally for Just Labor” event. Receiving another warm welcome, Steve was invited to speak briefly to the crowd. The group then marched to meet up with protests against the separation of immigrant families. Steve’s in town this coming week with interviews, events and meetings. Join Steve this Friday, June 29th at “Argentina in Revolt,” a forum featuring socialist feminist and human rights activist Maria Alvarez. Sponsored by Radical Women and the Freedom Socialist Party, you can find details on Facebook and socialism.com. The Hoffman campaign will also participate in Saturday’s “Families Belong Together Rally” currently scheduled for the Seatac detention center. See info below. • YouTube videos! 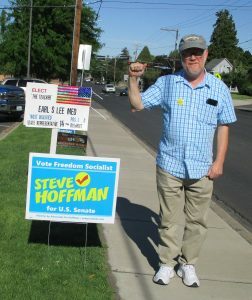 What issue raises your hackles and makes you happy to support Steve Hoffman for U.S. Senate? We’ve posted some supporter videos on the Hoffman YouTube Channel and would love to post more. Campaign volunteers can either video you expressing yourself or share your raw video and we’ll edit. Email VoteSocialism@gmail.com to sign up! • Yard sign selfies. Many supporters have yard signs in their lawns or windows. Snap a pic of you and your sign and email it into Hoffman Headquarters! The snap on the right is Assistant Campaign Manager Jared with happy yard sign recipients in Tacoma. • Meetups this week. Volunteer Night Wednesday will go from 6:30 to 8:30pm from now until election night. The 6:30 start time works with many schedules and the evenings stay light longer. The campaign will also gather at the “Families Belong Together Rally”, Saturday June 30th, 11am at the Seatac Federal Detention Center, 2425 S 200th St, SeaTac, Washington 98198. Steve’s campaign is bigger than one candidate and we hope the ideas and support generated will go on beyond one election. Events, especially in these past few weeks, show the need for militant action, for democracy in organizing, for independence from the twin parties of the bosses. That’s why we’re raising money–to keep the momentum going, to keep spreading the word, to stand up and fight back every chance we get. Every dollar we get is important. Make checks payable to Advocates for Hoffman, mail to or drop off at 5018 Rainier Ave. S., Seattle, WA 98118. Online donations accepted here. Thank you! This it for this week. Happy Pride!